I couldn’t believe my luck in finding this film on sale at F.Y.E. in Astoria recently! 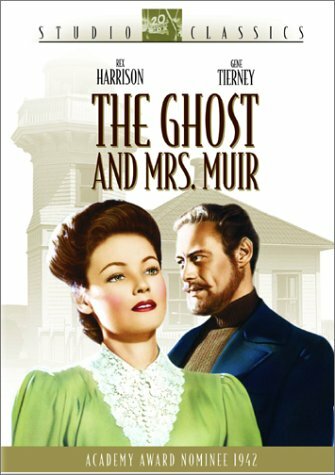 I had wanted to see The Ghost and Mrs. Muir for a long time. This is an exceptionally well-made Hollywood classic (out in 1947) film starring theatrically-trained/powerhouse actor Rex Harrison (the ghost, Captain Daniel Gregg), one of Hollywood’s most beautiful movie stars Gene Tierney (Mrs. Lucy Muir), charming/rakish comedian George Sanders (Miles Fairley), respected character actor Edna Best (Martha), and a very adorable 8 year old Natalie Wood (Anna Muir). 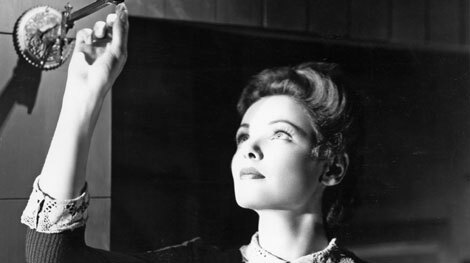 The unusually beautiful music will stay with you long after the film; the composer also worked on Citizen Kane and collaborated many times with Hitchcock. It was a big success when it first came out, and also received great reviews from critics- you’ll see why! It combines the genres of thriller, romance, and comedy. But romance is key! The story opens at the start of the century (1900 that is) in London. Young widow Mrs. Lucy Muir, whose husband passed away a year ago, is living with her mother-in-law, sister-in-law, daughter, and housekeeper. The ladies are all dressed in mourning clothes. She expresses a strong desire to live on her own (with the income from her husband’s gold shares), much to the shock and disapproval of the in-laws (two hysterical, overbearing ladies). Mrs. Muir has decided that the seaside will suit her well; she sets off with the eager Anna and loyal Martha. The cranky ghost of Capt. 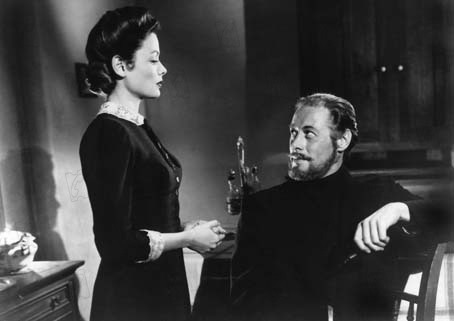 Gregg, dressed all in black except his silver buckled belt, reveals himself to Mrs. Muir soon after the family moves in; he’s not happy to have people in his house. 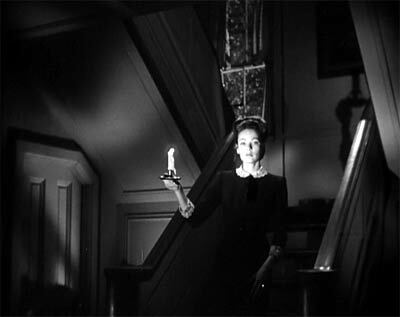 But she stands up to him; she’s not scared by his actions (noises, swearing, extinguishing candles). She earns respect for that. In that (first meeting) scene, their faces are only lit. Light and shadow are used very cleverly and purposefully in this film. Capt. Gregg is unlike the ethereal, other-worldly ghosts we’re used to in modern/special-effects laden movies. 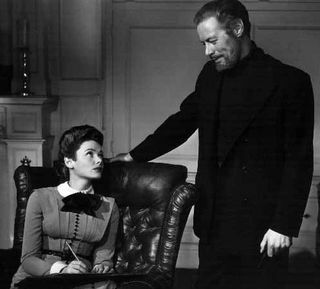 He seems “real” to the audience, because Rex Harrison creates a very masculine, humorous, and witty character. Harrison uses his strong physical presence (a must for any leading man), commanding voice (after all, he was chosen for My Fair Lady even though he couldn’t sing), and (especially) his eyes to “bring life” to the ghost. 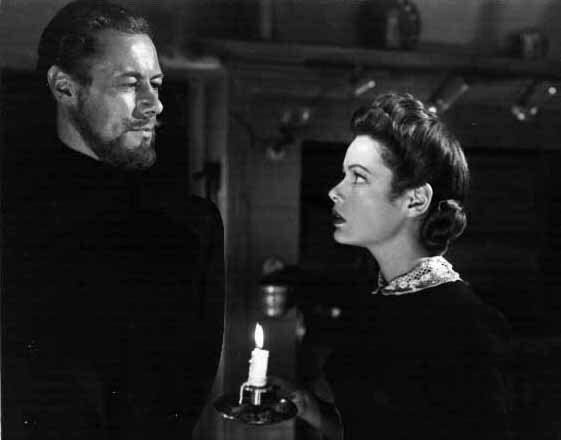 But we also wonder if he is a figment of Mrs. Muir’s imagination? Harrison is great at reacting to his fellow actors- a big part of acting. In my honest opinion, the only way to get through the over-hyped Cleopatra is to focus on his portrayal of Julius Caesar. 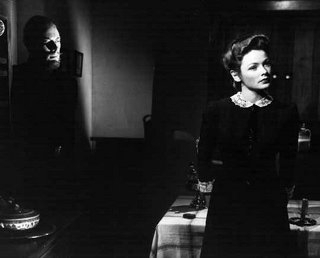 The ghost and the widow become friends; they “occupy the same domestic space like a married couple” (Jeanine Bassinger, chair of the Women’s Studies department at Wesleyan points out on one of the commentary tracks). However, he has no body, so Mrs. Muir is safe; this satisfied the censors of the day. When her investments fail, her in-laws come to visit; they urge her to go back with them to London. But Capt. Gregg forms a plan- he “ghostwrites” a book to boost her finances. Over some months, Daniel dictates to Lucy (or “Lucia” as he prefers to call her) the story of his lusty, adventurous life. They work together and fall deeply in love. It’s a sad fact that she is alive and he is dead! When Mrs. Muir goes up to London to see a publisher, she catches the eye of Miles Fairley, a well-dressed, smooth-talking, wealthy man in the office. He’s not exactly her type of man, but he’s real. Will Mrs. Muir let this (corporeal) man into her heart? There is a similar choice to be made in Anthony Minghella’s first film, Truly Madly Deeply (if you want to know more). I highly recommend this film to everyone, not only fans of classic black and white films. It seems modern to me, in many ways. The music, lighting, costumes, etc. all work to create a memorable picture. The exchanges (even the ones without words) that Harrison and Tierney have are terrific; you can see that their characters care about and respect each other. The film is also “very literate” (Bassinger comments). This is an intelligent viewer’s movie, though it also evokes emotions. It is about loss, yearning, and “the dream of love.” In reality, men are not perfect. And not everyone has love in their life. But we all dream!